25 June 1971 Born in Lurgan, Northern Ireland. 1987 Joins Manchester City from Glenavon and makes one appearance for the Sky Blues. 1990 Moves to Crewe Alexander and makes a total of 187 appearances, scoring 18 goals, for the club. 1994 Makes his Northern Ireland international debut in June as a substitute against Mexico in Miami. 1996 Signed by Martin O’Neill for Leicester City in February in a £750,000 transfer and helps Foxes gain promotion to top-flight that season with play-off victory Crystal Palace. 1997 Picks up first major winner’s medal after Leicester beat Middlesbrough in League Cup final. Wins competition agains three years later. 2000 Is reunited with O’Neill in December at Celtic in a reported £5.75 million switch and helps Hoops win the domestic treble that season. 2002 Retires from international football after receiving death threat before a game against Cyprus. Played 40 times for his country, scoring twice. 2003 Is part of Celtic side that loses the UEFA Cup final to Jose Mourinho’s Porto 3-2 after extra-time. 2005 Is appointed Hoops captain following the arrival of Gordon Strachan as manager. 2006 Reveals in his autobiography, Man and Bhoy, that he has battled depression. 2007 Skippers Celtic to Scottish Cup victory over Dunfermline in May in his last game for the club. Wins five Scottish league titles, four Scottish Cups and two League Cups during his time at Parkhead. 2007 Joins Nottingham Forest as player/coach and is linked with Hibs managerial vacancy in December. 2008 Moves to Wycombe in January. 2008 Returns to Celtic as a coach under Gordon Strachan in April. He is the victim of an assault in the West End of Glasgow in August. Remains part of the backroom team following Tony Mowbray’s appointment as manager in June 2009. 2010 Appointed Celtic caretaker manager in March for rest of the season and team win all their remaining league games but they lose Scottish Cup semi-final to first division Ross County. 2010 Lennon is handed role on permanent basis in June. 2010-11 Beaten in first competitive game a month later in a 3-0 defeat at Braga in Champions League qualifier and Celtic fail to reach Europa League group stages following aggregate loss to Utrecht. Celtic also lose out to Rangers in the SPL and in the League Cup final but lift Scottish Cup. 2011 In January, packages containing bullets sent to Lennon and Northern Ireland winger Niall McGinn are intercepted by Royal Mail in Northern Ireland. 2011 In March, a parcel bomb intended for Lennon is intercepted by the Royal Mail. 2011 Is attacked by Hearts fan John Wilson on the touchline during a game at Tynecastle in May. Wilson is jailed for eight months for a breach of the peace. 2011-12 Celtic clinch the league title but fail to progress from their Europa League group, finishing third. 2012-13 Leads Celtic to Champions League group stages and masterminds memorable 2-1 win over Barcelona at Parkhead. The Hoops reach the last 16 knock-out stages but were beaten 5-0 on aggregate by Juventus. Lennon guides side to League and Scottish Cup double. 2013-14 Reach Champions League group stages again but collect one win against Ajax. Leads Celtic to third successive league title, losing only twice and scoring 102 goals. 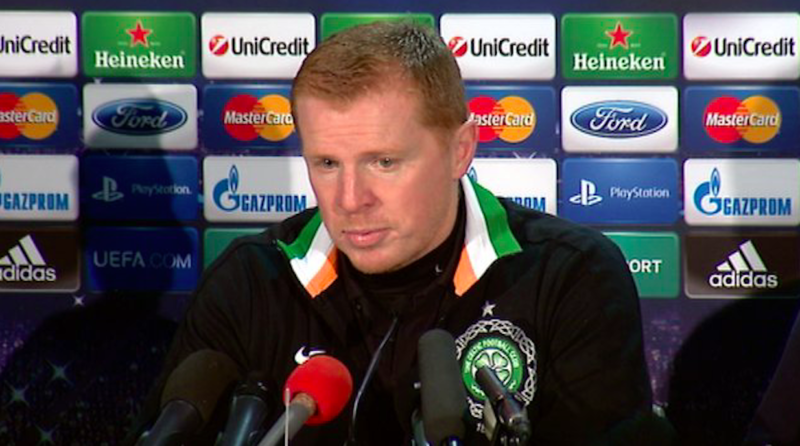 2014 Lennon steps down as Celtic manager in May. He had a win rate of 69 per cent while in charge of the Hoops. 2014 Signs four-year deal to become new Bolton manager in October and club survive relegation with 18th place finish in English Championship. 2016 Steps down by mutual consent in March with Bolton, who were plagued by financial problems, bottom of the table. 2016 Lennon is announced as the new Hibernian head coach on June 8, signing a two-year-deal.